ANDRÉ CHRISTOVAM is known as Brazil’s main blues artist, with a long history of more than 35 years on the road. 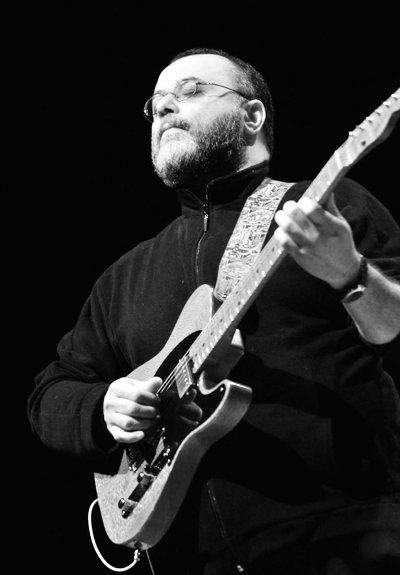 A former graduate from the Guitar Institute of Technology (Los Angeles, California) in 1981 - their first Brazilian graduate - for over ten years he worked as a demanding studio ace and sideman, playing and recording with rockers like Rita Lee and Sergio Dias (from the Mutantes), Raul Seixas and icons of Brazilian instrumental music such as trombonist Raul de Souza, clarinetist Paulo Moura and guitarist Heraldo do Monte. He has six solo albums released solely in his home country and more than 20 years as a recording artist. Although he has performed in the US before and traveled to Europe were he lived briefly, his reputation has been mainly confined to Brazil. Outside his role as bandleader and session ace for many Brazilian acts, André has toured, recorded or jammed with many American musicians. Here is just a small list: Albert Collins, Carlos Santana, Taj Mahal, Buddy Guy, Junior Wells, Marc Ford (Ford Blues Band), Bruce Ewan, Sugar Blue, Magic Slim and Bo Diddley. He was also the Music Director for the largest Blues Festival in South America since 2002. The Natu Blues Festival, an event responsible for bringing down to Brazil musicians of the highest caliber as: John Hammond, Carey Bell, Hubert Sumlin, Kenny Neal, Coco Montoya, Deacon Jones, Big Time Sarah, Lucky Peterson, and Deborah Coleman, among others. André plays Forest Green Compressor and his favorite pedal of all time: Sweet Honey Overdrive.